I have come across Coedit.me recently, by Ochronus. 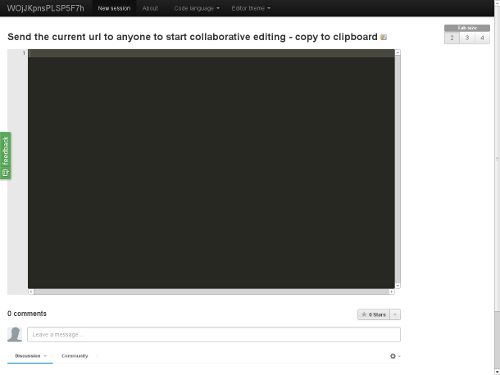 It is a text editor that allows more than one person to work on the same document, simultaneously. To create a buffer click Start editing button in the homepage. This will generate a URL just for that buffer (or document if you prefer). Now people you share this URL can join you editing this document. You can choose the language (programming language, if you are editing code) and change the colors from the top menu. Below the editor area comments are placed so the conversation around the code can happen right there. The feedback tool requires you to log in, that’s why I am writing here. I don’t suppose many of the potential users will want to authenticate with a 3rd party service just to give feedback either. Gist integration would be awesome! I think it would be much better if the code language (and tab size) is synced between instances. So should the comments, AFAIK the 3rd party service requires a reload to see new comments. I’d like to be able to open multiple documents in a single window (and single URL).